I’ve been thinking about this whole “natural wine thing” for a good few years now and have been following posts and articles and commenting on people’s wine blogs, and I’ve even written a few posts myself. A lot of ideas and concepts have been percolating around in my subconscious during all this time and every so often I’ve received direct conscious stimulus, via reading, via my own commenting and via real-life conversations. And recently the whole big formless thought-mass in my brain seems to have coalesced a bit and so I wrote this post. I hope it’s the last one I write for a long time, because I’m a wine producer, not a wine writer! But anyway, I had to get it all out! The World of Wine is Different? This acrimonious debate (between natural wine proponents and natural wine detractors) doesn’t happen in the world of beer. There’s been a “Real Ale” movement around for years and years, and ALL beer drinkers seem to be very happy living together and drinking their beers together. There are no real ale enthusiasts who go around saying that conventional beer is adulterated industrial rubbish; neither are there any conventional beer-drinkers/writers who say that real ale is ‘faulty’ and/or a marketing ploy, while grudgingly admitting that there a few good real ales out there. It doesn’t happen in the world of food either. There’s a market for say, hand-fed, free-range turkeys, and another one for factory-farmed supermarket turkeys. Same applies to cheeses, hams, eggs, pâtés… you name it! And all these consumers and writers seem to be quite happy to get on with it without attacking the other side. 1. The fact that wine is an alcoholic beverage sets it apart, I think, from any other food item. The fact that alcohol alters your state of consciousness must in the end make you more enthusiastic or passionate about the product! Wine (alcohol) can make you feel … well, any emotion you can define, depending on your predisposition and circumstances and events at the moment of drinking: on the positive side, happy, mellow, optimistic, irrationally exuberant, passionate, etc … and on the negative side, sad, depressed, violent, ill, etc. The important point being that it makes you feel ‘different’ from your normal state. This is something that a food item, no matter how exotic or well-cooked can never ever make you feel. (Well, maybe chocolate! But chocolate-lovers also just eat and enjoy their favourite quality chocolate – they don’t have debates about industrial chocolate). 2. But what about beer then? Why is there not such a wide range of passions inspired by beer, which is also an alcoholic beverage? Beats me! Thoughts, anyone? 3. Wine also has certain ‘romantic’ sub-conscious cultural connotations attached to it, in the sense that many people dream about owning a vineyard (like they do about winning the lottery), but no-one dreams about owning a turkey-farm, or even a brewery! There seems to exist in all human beings’ minds this Jungian isotope of a bucolic winemaker, in his dusty cobwebbed cellar, lovingly and carefully hand-crafting his wine! This also must contribute to inflaming passions about natural wine, even though this bucolic picture is as far removed from reality as it’s possible to go. But the above factors are not enough really, to actually cause all the acrimonious debate we’ve been seeing lately. Enabling and contributing factors, maybe yes, but there’s something missing. Well, a chance conversation a few weeks ago, made another piece of the puzzle fall into place for me. I was talking to a person involved in both the wine AND the beer world, and this is what he said. The beer world is dominated by a very small number of very large multi-national companies who between them have over 90% of the world market and the rest is made up by tiny local artisan type outfits that have little to no impact or influence on anything. In addition, the world beer market is a lot bigger than the world wine market. In contrast to this, the wine world is atomized. There are a few big global wine players but there’s no comparison with the big beer boys. Then there are literally thousands, if not tens of thousands of large-sized wineries, middle-sized wineries and even more small-sized wineries, and countless numbers of tiny, unclassified, unregistered micro-wineries. And all these players have a voice, and influence and are actually listened to. So, to continue, the only conclusion I could come to (utterly incredible as it seems) was that certain conventional wine-makers are running scared! They must be seeing a real threat in the whole natural/organic/biodynamic wine movement. I realize that this is an incredible thing to say, and I’ve been shocked myself for weeks, but I can’t come up with any other explanation. This doesn’t happen in the beer world because the handful of multinationals are so big and so totally dominate the market that they have nothing to worry about. 1. A lot of ‘conventional’ wineries (large, middle and small) are going bankrupt; they can’t sell their wine, and they can’t even under-sell it. Because their wine is boring, globalized, and indistinguishable from any other of the tens of thousands of similar brands from all over the world. No way can they compete with a natural/organic/biodynamic wine in the same price bracket! Or I am wrong? 2. The Environmental and Health Issue. Consumers are becoming ever more aware of the issue of additives in food products and the use of chemicals in agriculture, and are slowly but surely shifting their purchasing decisions in the ‘green’ direction. Some conventional wineries – the ones with savvy and resources – have been moving in that direction for years. But others just can’t, or don’t want to do it, for whatever reason. They’re between a rock and a hard place. 3. The Labelling Issue. Related to the above, consumers are starting to question why wine is exempted from the requirement to list all the ingredients on the packaging of a food product. Natural/organic/biodynamic winemakers tend to be quite open and vociferous about this issue, and that’s another point in their favour vis-à-vis the consumer. 4. The Quality Issue. I’m not talking about mere compliance with legal, health & safety, and technical requirements, and then printing a ‘quality seal’ on the label. I’m talking about the real intrinsic quality of the grapes and of the purity of the finished product. Conventional (industrial-chemical) wine may well taste nice and comply with all the current tasting criteria, but that’s not enough. More and more consumers know that its full of unnecessary chemicals and substances, that may even have health implications even though they are legal and deemed ‘safe’. There’s no comparison between the clean, pure, pristine aromas and tastes of a well-made natural wine, and those of a ‘well-made’ industrial one. A Twitter conversation some time ago, about ‘quality’ wine, made me realize that there’s actually a lot more natural wine and natural wine-makers out there than people realize – and they’ve been around for a long, long time! The thing is, they don’t promote themselves as such. I’m referring to top-of-the-range quality wine producers (‘conventional’ ones), who have been quietly practicing organic/sustainable/biodynamic agriculture in their vineyards, but without publicizing the fact; and who have been respecting the must/wine in the winery and haven’t been over-manipulating or intervening excessively; who in fact have been producing natural wines without telling anyone about it! And some of them have been doing it for a long, long time – long before the ‘green’ movement started back in the 1970’s. I think that this fact is very interesting and significant. And they’re not the ones that are going bankrupt! Basically, conventional industrial-chemical wineries have got a lot to be worried about. In the middle of a world recession, the only sector that seems to be actually growing is the organic/ natural/ biodynamic/ green sector, including wine, so they are seen as direct competition. Hence the aggressive reaction to the natural wine phenomenon. They’re defending their turf – by attacking! Well, I think that everybody (proponents and detractors alike) already know that it’s not natural to plant vines in rows, to prune them specifically to promote fruit production as opposed to foliage, and to use machines and constructs to make wine. Anything that humans do, using even the most basic tools is not natural by that definition. The unspoken, unwritten connotations of calling certain wines ‘natural’ implies that other wines are ‘un-natural’ - and that’s not nice at all for the producers and sellers of those ‘other’ wines! (same applies with words like ‘authentic’, ‘real’, ‘sustainable’, etc). I used to be kind of understanding and a bit embarrassed about this issue, and actually took the side of the conventional wine-makers, but I have to say that I’ve come round, and now I think that it’s perfectly fine to call certain wines ‘natural’, because basically it’s TRUE. The unnecessary additives and excessive processing totally de-naturalize those other wines. The number and range of these additives and aggressive processes that can be applied to wine-making is truly mind-boggling; the final product is so far removed from the grapes and the land that the figure of ‘wine-maker’ is no longer even relevant – we’re now talking about process engineers and chemists - chemical soup-makers adding ingredients and cooking up soup-wines to order, in accordance with commercial and industrial criteria of convenience. So why the semantic attack? I think that the reason that critics focus so much on semantics is that deep down they also know that it’s true. And it hurts. It’s perfectly obvious, by any definition, that the wines they’re making or promoting are totally un-natural. They’re attacking because attack is the best form of defence, even if it’s a totally irrelevant and trivial attack. Basically, this semantic criticism is just a distraction from the real, more interesting issues related to natural wine. Those semantic related posts should really be posted on a linguistics page, where etymologists and wordsmiths can discuss the different meanings of the word ‘natural’ in the English language. Many posts critical of natural wine say that this natural wine thing is just a passing fad, a marketing ploy, just the latest cool thing to talk about, write about and drink. Well, on the one hand, I think that this is true, because there really is an extraordinary amount of debate going on, and there are things happening in the real world too (like new natural wine bars opening up, restaurants including natural wines in their wine lists, etc). Well, yes! That’s how we humans operate! Things go in and out of fashion, and now it’s natural wine’s turn to be in the limelight for a while, until the next big thing comes along. But on the other hand, I think there’s more to it than that. Much more. I think that this ‘fad’ is part of a much wider, further-reaching and longer-term phenomenon: I’m talking about the slowly and gradually increasing awareness by the general public of the environmental and health issues related to industrial and chemical food production (including wine), which started back in the 60’s or 70’s, if not before. Natural wine is just another facet of the same ‘organic’, ‘biodynamic’, ‘sustainable’, ‘green’ movement. The zeitgeist has been getting greener for decades and is getting greener and greener as time goes by. Food scandals and health and environmental tragedies happen regularly every year or so. (I won’t bore you with a list, but just quickly remember, for example: Mad Cow Disease, Swine Fever, poisoned Perrier water, dioxin chickens, wine with methanol, the Hungarian toxic sludge disaster, etc, not to mention certain chemicals suddenly being banned which were previously deemed to be ‘safe’). Just type “food scandal” at Google and see for yourself. I think the industrial-chemical wine producers and promoters know that slowly the tide is turning, that the zeitgeist is greening, and that their numbers are up! In fact, for many of them, touched by the recession, it’s endkampf already – they’re going bankrupt and they can’t sell their wine. Real data from reliable official sources back me up here – see the exponentially increasing graphs of organic land under cultivation and of new companies producing and/or selling organic products (United Nations FAO, EU Agriculture Directorate, Spanish Ministry of Agriculture, for example). Basically, this criticism is also just a distraction, with no real content related to natural wine worth discussing here. Such criticisms should really be posted in a marketing or sociology page. Posts critical of natural wines sometimes contain personal references to individual natural winemakers who either said or did something weird, or who in fact really are a bit eccentric. These references are intended to de-legitimize the winemaker by implying that he or she is not a true professional and is more concerned with ‘weird’ stuff like astrology, tree-hugging, cow horns, etc than with the serious business of making wine. Any serious wine critic would just taste the wine in question and professionally criticize it. Again, I’d say this is just another example of distraction, mud-slinging, and finger-pointing. Another criticism is the insinuation that unscrupulous natural winemakers are selling faulty wine to an unsuspecting public. As far as ‘unscrupulous’ is concerned, firstly I don’t think that natural wine-makers are a species apart and not susceptible to normal human failings. Common sense would suggest that there obviously must be some natural winemakers who are in fact unscrupulous. But it would be a pointless task, in my opinion, to try and find out the exact percentage! And secondly, I’d say “Look who’s talking!” Just think of the number and magnitude and frequency of conventional wine scandals, perpetrated by unscrupulous conventional wine people! Again I won’t bore you with a list, but just quickly remember only last year when unscrupulous French wine producers sold 18 million bottles of fake Pinot Noir to the USA!!! It’s really quite extraordinary for conventional wine people to accuse natural wine people of being unscrupulous! I suppose they must be thinking (again!) along the lines of “Attack is the best form of defence” or pointing the finger at someone else distracts attention from your own misdeeds. Again, just type “wine scandal” at Google and see for yourself. Basically, this criticism is yet another distraction. Many posts criticizing natural wines lump them all together and make sweeping statements like “Natural wines are “X” (insert adjective). This is illogical to say the least, as natural wines come in all possible ranges of styles, depending on the region, climate, grape variety, winemaker, etc. There are just as many, if not more styles and variations of natural wines as there are of conventional ones. It’s just as ridiculous to say something like “Conventional wines are “X” (insert adjective). Enough said! I’ve been saving this one for the last! The Numbers Game. Critics seem to imply that all or most (or just many) natural wines are inherently faulty, but common sense suggests that this simply can’t be the case. Natural wines have been around a long time, so if they really were all faulty then the consumers would have stopped buying them and the winemakers would have stopped making them! What are the real numbers? People who have been to natural wine fairs and tasted a lot of different natural wines would be in an excellent position to opine! Unfortunately, I myself haven’t tasted widely enough, but for what it’s worth, of the limited number of natural wines that I have tasted, I considered none to be faulty. Now for the “fault” issue. This is where I think an interesting, sensible and engaging debate could be had between natural wine proponents and sceptics. Because this is what it’s really all about! It’s about judging a wine on its own merits. It’s about tasting. The proof is in the bottle, after all, so let’s have no more nonsense about semantics, marketing ploys, mysticism or any other peripheral distraction. The fault issue is in fact, in my opinion, the ONLY area where a legitimate, sensible, useful and interesting criticism of natural wines can be made. So where do I stand on this issue? Firstly, I believe that many critics and tasters often find “faults” where none exist. How can I say such a thing? Because I suspect that many wine tasters and critics have become too accustomed to the standard, international, globalized, Parkerized style of wine that is considered to be ‘good’ lately, and their range of tolerance, or acceptability, is very narrow and restricted for all the measureable characteristics of a wine considered relevant nowadays. If any characteristic (acidity, fruitiness, sweetness, body, alcohol, volatile acidity, etc) falls outwith their restricted band of acceptability, they’re too quick to call the wine faulty. They can’t see the wood for the trees, or they don’t realize just how restricted and conditioned they’ve become by globally imposed homogenized commercial marketing based tasting criteria. Secondly, before globalization and planetary-scale exporting, there was a massive range of local wine styles, each of which had its own merits and de-merits. But now all wines, no matter where they come from, or what grape variety they are made from, have to be judged to one global, international standard (ie, Parker’s personal liking for big, alcoholic, oaky fruit-bombs). Why? That’s just one style of wine among many. But why should any wine whose traditional style was anything other than big, alcoholic, oaky and fruit-driven even be compared to such a wine, let alone judged by those criteria? Thirdly, I believe that the universal presence of sulphites (up to the legal limits) has also blurred critics’ and tasters’ ability to perceive the true tastes and aromas of wine. When these levels of sulphites are lacking (industrial-chemical wines can contain up to 10 times more sulphites than a natural wine), many previously masked tastes and aromas show through that a conventional critic cannot identify or recognize and immediately calls a fault. I think there’s immense scope for a mutually interesting and useful debate on this point, which I haven’t seen happening so far. For example, why are certain aromas and tastes considered ‘good’ or ‘positive’ today and others considered ‘bad’ or ‘negative’ and classified as ‘faults’. The most extreme example that springs to mind is the bubbles in champagne being considered a ‘fault’ back in the 18th century. Fourthly, in the case of oxidized (or oxidative, if you like) natural wines, conventional critics simply don’t understand that far from being faulty, these wines were in fact made that way on purpose! They are a genre of wine in their own right. Consumers actually like them, buy them, drink them and enjoy them! Like blue, mouldy cheese, for example. A conventional cheese-lover would recoil in shock and horror on being presented with such a cheese for the first time, and would immediately assume that it was 'faulty'. After all, the look, smell and taste of mould is nothing like those of your standard, globalized white cheese, is it? Fifthly, another thing that conventional critics don’t seem to realize is that cloudiness is not a fault either, but a deliberate feature! Some natural wine consumers actually like cloudiness (sometimes) and natural winemakers actually desist from filtering and/or clarifying on purpose! Why? Because some winemakers and some wine-lovers believe that when you filter and/or clarify wine you also take out the ‘good stuff’ (ie aromas and flavours) along with the supposed ‘bad stuff’. Cloudiness is really just a ‘commercial fault’ because market studies have shown that the average consumer prefers a transparent clear wine to a cloudy one. But what’s that got to do with good wine or good wine-making? Nada! It’s got everything to do with good marketing. So, where does all the above leave me? Well, as far as the debate is concerned, I’m willing to engage with any critic who focuses on the merits and demerits of a natural wine, in a professional or amateur capacity; I would love to talk about possible faults and characteristics and perception and ranges of acceptability and beyond; but I’ve no more time for semantics or other distractions, even though they’re interesting topics in their own right. And what kind of wines will I be making? ‘Natural’ or not natural? Well, I’m not going to get bogged down writing my own definition of natural wine and getting into pointless arguments, both with natural wine sceptics AND proponents. For me, this question is best resolved by full disclosure by the winemakers, of what they add and of what they take out, and of what they do and don’t do to the must/wine in the winery. Then consumers can decide for themselves whether the wine in question meets their personal criteria for being ‘natural’. It’ll be a different story, though, if/when legislation is passed officially defining natural wine! So, that’s what I intend to do: provide all the relevant winemaking information on the label and on my webpage. I’ll be making wines that are top quality – according to my own definition above (and of course also complying with any legal requirements). I believe that the quality of the grapes is fundamental to the quality of the wine. So I’ll be both growing my own, and also buying in from known and trusted growers. I won’t be adding any chemicals, and I won’t be taking anything out. I won’t be subjecting the must or wine to any unnecessary processing. I guess that makes my wines pretty natural, but I also won’t be dogmatic. If I have to use sulphites, I will. If I have to choose between intervening in some way or risk losing the wine, then I’ll intervene. This may make the wine in question a bit less ‘natural’ in the eyes of some, but I can live with that. My intention is of course not to intervene, but sometimes “mistakes are made”, as they say, due to inexperience, carelessness, or whatever. But even in these worst case scenarios of unavoidable intervention, my wines will still be of a higher quality than an equivalent industrial-chemical one, and will still easily comply with any current organic legislation. I’ll be growing grapes in a way that is actively beneficial for the environment, and supporting other growers who work in the same way. I won’t be purchasing chemicals, and polluting the soil and groundwaters, and killing wildlife. On the contrary, I’ll be creating biodiversity and improving the fertility and structure of the soil. I’ll be making wines that express all the above! I’ll be making wines that taste good, but not at any cost; like I said, I won’t support the chemical industry that is partly responsible for the world’s pollution and health problems. Ultimately, this is a very personal decision, because I could easily produce chemical wines if I wanted to – in fact it would probably be easier and cheaper for me! But I’ve decided. Life is short! I want to do something that is not only immensely gratifying to me personally in the present, but is also socially useful and positive, and contributes to leaving the world in a better state than I found it in, for the benefit of our children and future generations. As opposed to the industrial-chemical approach which basically consists of abusing the environment, and treating it as if it were a free dumping ground for their effluents, to be cleaned up later, by others, in the interests of short-term production at any cost. This is what I’ve decided. The proof is in the bottle. All the rest is just words. That's great, Fabio! Thank you for taking the time to write it. In the UK during the 1970s real ale (simplistically beer that still has yeast in it) was closing in on extinction. Despite the rise in popularity of lager from the 1980s, real ale has been thriving for 25+ years and co-exists with the convenient and robust big industrial brands. The customer has choice and individual taste is respected. 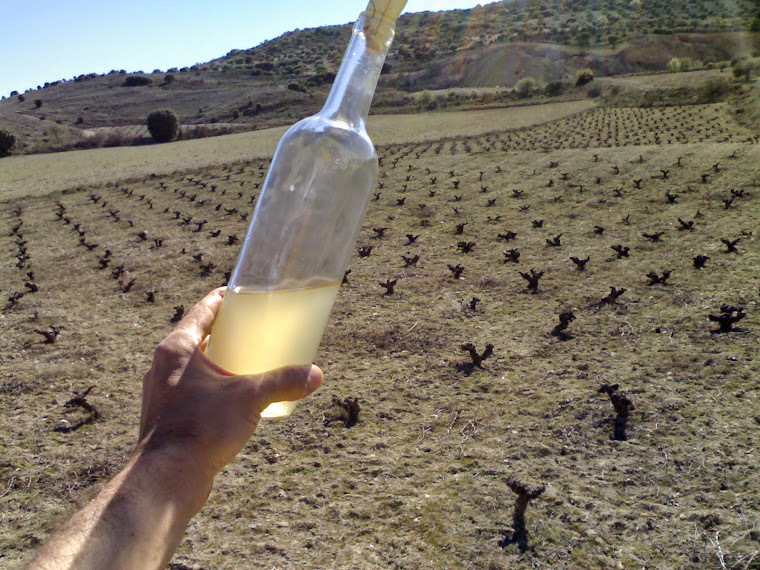 Natural wines (indigenous yeasts, no sulphur) are currently in the phase of becoming accepted as a respected choice i.e. a product with its own character. @Hank, and thank you for taking the time to read it. Yes, to the cellar! enough writing! @Graham, that's encouraging and optimistic. I hope you're right. Fantastic article. I think the longness is neccesary to explain all these "attacks" that we have to read in several foros and coments. When I read these attacks I think. Are we drinking the same natural wine? Or I´m lucky with my bottles? @Nacho, yes, I agree. I sometimes think "Where do they get these funky wines they complain about so much?" But, like I said in the post, I haven't really tasted enough different natural wines. We need a natural wine bar in Madrid!!!!! A lot there, Fabio, and most of it has been hacked over for years, which leads me not to want to get in to deep. You use the word "conventional" to describe what you call the "chemical industrial" wine business. Like "natural," I think "conventional" blurs rather than clarifies your point. Because, what you call "natural" used to be the conventional way of producing wine, and what you call "conventional" is the insurgency of the industrial world on all food processing, not just wine. I know, I know: it's semantics, but what do you expect from a writer? Seriously, words have power and they are at their most powerful when they are misapplied, which is likely why this issue keeps popping up. As for me, I want all wine and food to be as untouched by chemistry as possible, but I also know that nature can enhance or ruin the best of intentions, and I realize that rather than leave wine to the vagaries of nature, there are times when intervention is a must. Those who refuse to admit that are likely the ones who produce the so-called faulty wines to which you refer. Great work Fabio. Thanks for writing such a well thought out article on natural wine. As someone who works with and sells natural wine every day, I agree that I rarely encounter true 'faults'. Of course, there are some faulty natural wines, just as there are in the conventional wine world. But I do encounter misunderstanding from consumers & trade about certain natural wine characteristics and winemaking techniques. Your article is breath of fresh air. The semantic problem is just a translation problem. "Naturel" in french (were the term comes from) don't means just "coming from Nature" or "without human intervention" as in English it seems to do. In Spanish is the same than french. I just don't agree your point about cloudiness because the wine becomes clean naturally, waiting the needed time of course. So, it's not just a marketing issue. In any case, cloudy doesn't mean faulty. distraction techniques. Who can compare all the faults of the natural wines with any of those scandals, any of the tricks in the industrial wine (food) making. I congratulate you for your commitment at the end of the post, the way is not become the most of the most of the "naturals", it's just say to the people what you do and let them choose. You are brave. I think you're mostly right about the reasons for pushback against the term, but I'd take a step in another direction and point out that the etymological pressure (whether one wants to call it a movement or not) is already having a salutary effect. Because it's my sense that more and more winemakers are actually taking on the core precept of natural winemaking -- whenever possible, don't intervene -- rather than its reverse (usually, and obfuscatorially, expressed as "making the best wine we can" or "sparing no effort to craft the finest possible expression of X" and so forth). Not everyone is going to be "natural" (by whatever set of dogmas one adopts), not everyone can be (some terroirs make it unlikely), and not everyone should be; the world's wine desires, even just in terms of quantity, are always going to require some form of industrial production to satisfy them. But we've gone, in a fairy short time, from a conversation in which "of course I add yeast, it's crazy not to" and its brethren in other realms of winemaking and grape-growing to a real debate, in which the "of course" part is no longer just accepted without question. People had questioned those alleged sureties all along, of course, but the existence of a populous and loud alternative in the guise of natural wines and their advocates is what pushed skepticism of conventional practice into the general conversation. And that, to my mind, is an unmitigated good. Creo recordar que Nicolas J., hacia referencia a los ruidos y las vibraciones en los liquidos. Es una forma holistica de entender la enología. Como diría Terry Theise: "Beauty, Harmony, Distinctiveness, Soul is expressed as a trinity of family, soil, and artisanality". Again, I prefer my wine and food as chemistry-free as possible, which is why I have a greenhouse, so I can grow chemistry-free produce all winter long. And when I make wine, the only chemistry I use is SO2, unless I am forced to clean up a mess that either I or nature made. Still, I do not believe that winemaking is either dogma or ideology, because dogma and ideology often lack perspective. For instance, can anyone explain why ancient winemakers well before the birth of Christ felt it necessary to add all kinds of substances to stretch, preserve, and make palatable their wines? Can anyone explain why second-century Roman winemakers introduced SO2 to the process? Does anyone know what happened to the island of Madeira grape growing before scientists understood and discovered treatment for Oidium? Should the grafting fix to phylloxera that took Old World grapevines off their own rootstock in order for their survival never have been considered, as it changed the natural order of things? Perspective is far more instructive than ideology. You are absolutely right. If you think about it, 'conventional' should mean 'natural', because that's the way wine has been (conventionally) for thousands of years; while it's only been made industrially-chemically for, say 50 years. I think I was being excessively polite, or politically correct, so as not to offend the industrial-chemical camp! But we're living in the times we're living! The great majority of wines are produced industrially-chemically, so therefore they're called 'conventional'! C'est la vie. So now we have another issue to fight for: the true meaning of the word 'conventional'! Faults: like I said in my post, I haven't tasted enough different natural wines myself to have an objective view; but if you, who work in the business, say they are few and far between, my intuitive common-sense guess must have been right! Cloudiness: Hmmmm, yes, I said "...a deliberate feature." Maybe that's a bit too much! (I should have revised my text more, but I'm not a profesional writer!). To clarify: I don't think any natural winemake actually tries to make a cloudy wine on purpose (I don't), but if after settling over time and racking a few times, the wine is still cloudy, then so be it. I certainly don't consider it a fault. If there's one thing I'm dogmatic and ideologistic about, it's my dislike of dogma and ideology!!!! Interesting questions. I'll get back to on those. Qué bonito. Tendré que leer sobre eso un día. En mi post, me he olvidado por completo mencionar la parte espiritual, holística, la armonía con la naturaleza y la vida; unfallo tremendo, pero estaba enfocado en la parte técnica, física y mondana del asunto. Las dos cosas son necesarias, no? What you say is very encouraging. I'd never seen it from that perspective before, ie that the very fact that a debate is actually happening is a good sign! FInally got around to reading this (long) article. You raise some interesting points, but I would say that there is a reasonable flaw at the heart of your thinking, and it comes right at the beginning of the article. My (limited) experience of Real Ale drinkers is that they are EXACTLY like everyone else and are just as likely to be scathing of "mass produced" beer, particular the big brands (just ask a Real Ale drinker about Budweiser and see the reaction). Wine is not special in this discussion, and hence it is not just about the product of the grape and the businesses involved in it, it IS a debate being seen across all of society. There is a schism between the worlds of global industrial standardisation and quality management, and that of artisan, individual and expressive products. The argument is because we see the world differently, they almost exist in separate universes in fact if you look at the consumers, and therefore COULD exist in parallel ... except people always love to comment, criticise and make their points. I have not read the recent book on Wine & Philosophy (I think Jamie Goode edited it or at least was involved), but I am guessing it could be relevant. We all act (taste & critique) like there is some sort of Universal Truth in wine and can judge a wine to be good (whether mass produced or cloudy and oxidative), but in fact there isn't and can't be. We just have different yardsticks for making our judgements, and therefore we will not agree. Real Ale. OK, point taken. That was a mistake on my part, because I didn't actually do any research on the beer world to see if what I assumed was actually true. I just went and wrote it! I can see I was totally wrong on that issue, judging by the comments I've received. It's a bit unfortunate really, as it wasn't really the main point I was trying to get across, which was the "supposed fault" issue. Lesson learned there: "Never will I ever write anything again without doing a bit of research first to back up my ideas/suppositions with facts!"